We’ve already reached the summer solstice, and the sun is now the strongest it will be all year. So now’s a good time to remind everyone to use sunscreen anytime you go outside for more than 30 minutes. Even if you’re almost fully clothed, you still need to protect your face, ears and tops of your feet. Why? Because these are common “hot spots” for developing skin cancers later in life, including the deadly melanomas. I address my comments mostly to men, as I’ve noticed that men use sunscreens a lot less than women, especially as women are much more proactive in preventing wrinkles and much of their facial moisturizers already contain some SPF protection. You could definitely argue that men have been ignored by skincare companies and thus we are thus relatively ignorant consumers. There’s some truth to that, but not anymore. Now, the men’s skincare industry has exploded in popularity, so now I am happy to report that there are a lot of men-specific skin products for men at all large markets and pharmacies, including Watsons and all the hypermarkets. 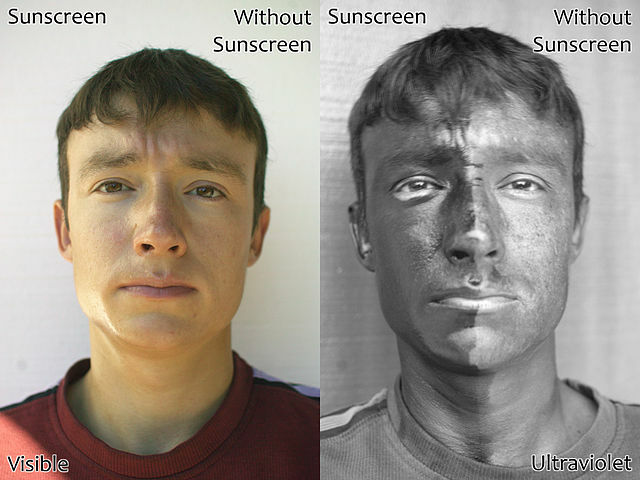 Which takes me to my main point: everyone should be using sunscreen protection on their face every day, every season, every year. Even in the wintertime, the sun’s exposure on your ears, face and neck can lead to skin cancers, and the rates of these cancers are climbing all over the world. So here’s the perfect solution for men: most of you already shave every day, so why not use an aftershave that includes sunscreen? And then use a bit more of that onto your ears and neck? Bingo — you’re done. Every morning with your usual shave, now you’re greatly protected from the sun and also cutting down on developing wrinkles (an added bonus). This idea sounds so obvious that you’d think the market would be flooded with such products, yes? Actually, there remain shockingly few aftershaves with SFP protection. The selection in local Chinese markets is still sparse, but my long-term American favorite is now available in China: Neutrogena’s Triple Protect aftershave, with SPF 20. SPF20 is a decent strength, not as good as SPF30 but better than the bare minimum SPF15. This brand is much pricier here than in the US (around 110 RMB, cheaper online) but I still think it’s worth it. I’ve noticed only a couple other local men’s face products with SPF protection, but hopefully the men’s health market will continue to expand. Previous PostPreventing Diabetes: Brown is Always Better Than WhiteNext PostHigh Cholesterol: Which Diet Tips Actually Work?